Elmer C. Reider, a Portland flag merchant who was popularly known as the "Flag Man of Oregon," died Wednesday in a Portland hospital of complications arising from a coronary artery lesion. He was 64. Elmer Reider. Source: The Oregonian. A funeral will be at 11 a.m. Monday in the Portland Foursquare Church. Burial will be in Rose City Cemetery. In 1983, Mr. Reider paid $5,000 for “the inventor, good will and telephone number” of a Portland flag business. Renaming the company Elmer's Flag & Banner, he went on to build the business on Southeast Grand Avenue into what its vendors claim is the largest flag business in the Northwest. It has the largest flag showroom west of the Mississippi, according to his son, Michael Hale, who manages the store. Mr. Reider stocked more than 9,000 varieties ties of flags, said his son, including thousands of American flags, pennants and decorative buntings in shapes and sizes that ranged from a 2-inch pin to a 12-by-18-foot behemoth. He also carried the flags of more than 300 foreign countries, as well as magnetic signs, psychedelic banners and all manner of flag-related accessories. Despite the colorful smorgasbord of national and cultural symbolism that surrounded him, his heart belonged strictly to the Stars and Stripes of the red, white and blue. 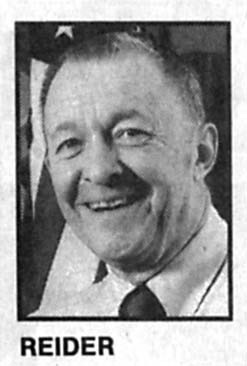 He was named president of the Portland Americanization Council in 1974. During the 1980s, he also was involved with the American Naturalization Council, helping to swear in new U.S. citizens “He gave the new people flags,” his son said. Mr. Reider was a member of the Portland Foursquare Church, the Christian Businessmen’s Club and the Eastside Commercial Club. He served on the Northwest board of Wycliffe Bible Translators and had been a board member of Officers Alive and the Salvation Army's social services program. Born May 26, 1927, in Portland, he was a lifelong resident of the city. He attended Sabin Grade School and was a 1945 graduate of Jefferson High School. Survivors include his wife of 35 years, Joyce; sons, Michael Hale and Randal Hale, both of Portland; mother, Catherine Reider, and sister, Alvera Becker, both of Portland; and five grandchildren. The family suggests remembrances be contributions to the Christian Businessmen’s Club or to Luis Palau Ministries. Elmer Reider was the son of Katherine "Blondie" Knippel and Carl Reider.